Below you can find a big collection of over 300 scales (please scroll down). See the scale notes and most important chords for each key of your keyboard. Plus: Free MIDI files and infographics! Here are some chords and scales as free MIDI files for you! 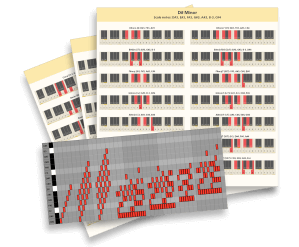 You can download the package here: Free Scale Chords Zip. Or buy the FULL Scale Chords pack - everything included with cherry on top! MIDI files for over 300 scales and modes. You can download an example file here (or take a look at the free pack first). You will receive the link to your download after the purchase.